U.S. Sen. Pat Toomey (R-Pa.) fields questions during a 'tele-townhall' event on Thursday, February 16, 2017. 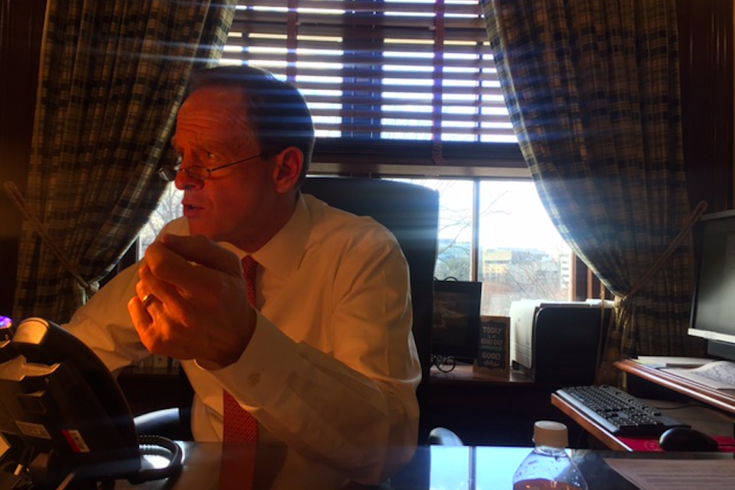 U.S. Sen Pat Toomey said he can’t believe “animal crushing” – the act of maiming and torturing small animals, often on fetish videos – isn’t illegal, so he's again introduced legislation to outlaw it. Though then-President Barack Obama signed the Animal Crush Video Prohibition Act into law in 2010, that didn’t make the underlying acts captured on “animal crush” fetish videos a federal crime. This new act – which Toomey, who tried something similar in 2015, co-introduced with U.S. Sen. Richard Blumenthal (D-Conn.) – would change that. The Senate passed the act in its last session of 2016, but it had to be reintroduced because the House of Representatives didn't have a chance to consider it amid Capitol Hill shenanigans related to the Supreme Court vacancy. The issue has been subject to free speech considerations. Toomey’s local peer in Congress – U.S. Sen. Bob Casey – also came out in support of this type of prohibition when it was considered in 2010. Wayne Pacelle, Humane Society president and CEO, was quoted in Toomey's announcement as saying the measure would "fortify the legal framework against cruelty in the United States." If PACT becomes law, those found guilty of torturing animals would face felony charges and up to seven years in prison. Read more Laws Animal Cruelty United States Pat Toomey Cruelty Animal Crush Videos Fetish Animals Torture Washington D.C.